A lot has been happening the past two weeks. About 4 months ago we started working on getting our mortgage with a large national bank modified. We had a 5 year interest only loan going with a pretty good interest rate that had about 2 years to go. We needed to get that refinanced and back on to a regular fixed rate mortgage, and if we could get the interest rate a little lower that would be great, too! Well, two days ago a large FedEx envelope from the lender arrived. Now, I know this lender is notorious for dragging their feet for months, and then saying "NO". I slowly opened the envelope and began reading the first page of the multi page document. It took several seconds for the obvious to sink in.....we had been approved, and the lender had lowered our interest rate to a wonderful 4.5%, and our payment remained the SAME!!! Well, today we had to get the documents notarized, copied, a cashier's check, and then FedEx it all back to Pittsburgh, PA so it arrives by Monday. OK, one thing off the long term check list that we will not have to worry about when we hit the road in the Fall. This past weekend we rented out 5 of the six cabins, and then we (me) had to clean them this week to be ready for this coming weekend. Elaine had to go down to Orange County for a two day overnight meeting for her employer, so it was left to me to get the cabins cleaned, and the linens washed. I started at 8am on Wednesday and finished around 4:30pm. Wow...that was a long day. I have a whole new respect for the hard working men and women who clean hotel rooms. Surprisingly, only one of the 5 cabins required a lot of work...the tenants must have had a bunch of small kids. What a mess. In about 10 days Elaine flies up to Oregon for her annual week long women's retreat in Cannon Beach, so I'll be baching it again, and it will be up to me to clean any cabins rentals that occur. Hmmm....how is that working out for me? As the summer season grows closer the park is filling up more and more each weekend, and actually there are a lot of people still here through the week. It's fun to watch our neighborhood evolve into something new each Friday. 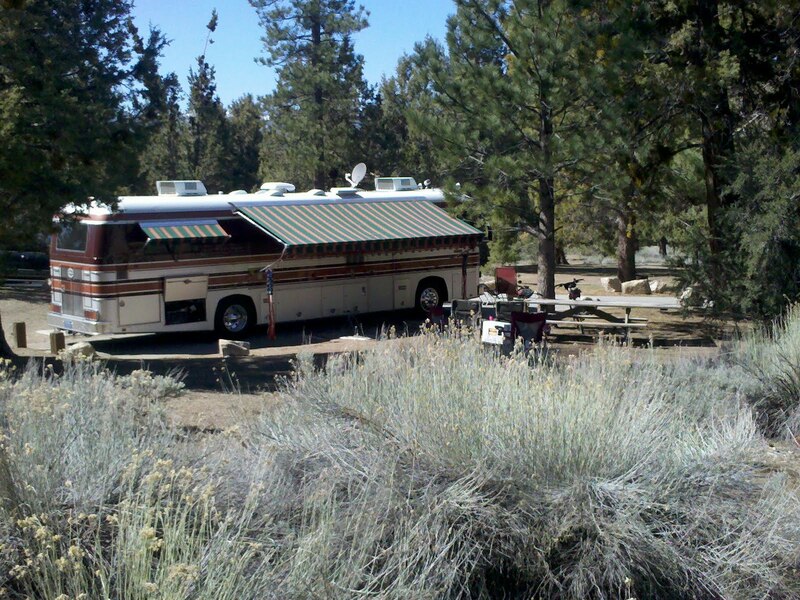 Right now as I write the motorhomes and trailers are steadily rolling in. The kiosk stays open until 10:30pm on Fridays so all the weekenders can check in. On our way back from getting all the mortgage paperwork done and sent off we got a call from our oldest daughter and agreed to meet her at Islands Fine Burgers and Drinks in Riverside for lunch. I love their fries, and their Big Wave burger is great with a wheat bun. Well, that's it for Rancho Jurupa Regional Park today....sitting watching the San Antonio Spurs on the verge of losing their opening series to Memphis. My Lakers closed out the Hornets in fine style last night winning by 18, and it wasn't really that close. 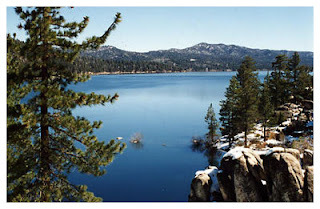 My brother called me a few weeks ago asking if we could join them at Serrano Campground on the north shore of Big Bear Lake, CA for a long weekend starting April 14th. Of course, we never turn down an opportunity to change the view out our front door, so I said "YES!". We live at around 800' elevation in Rancho Jurupa. Serrano Campground is at 7,000' elevation. 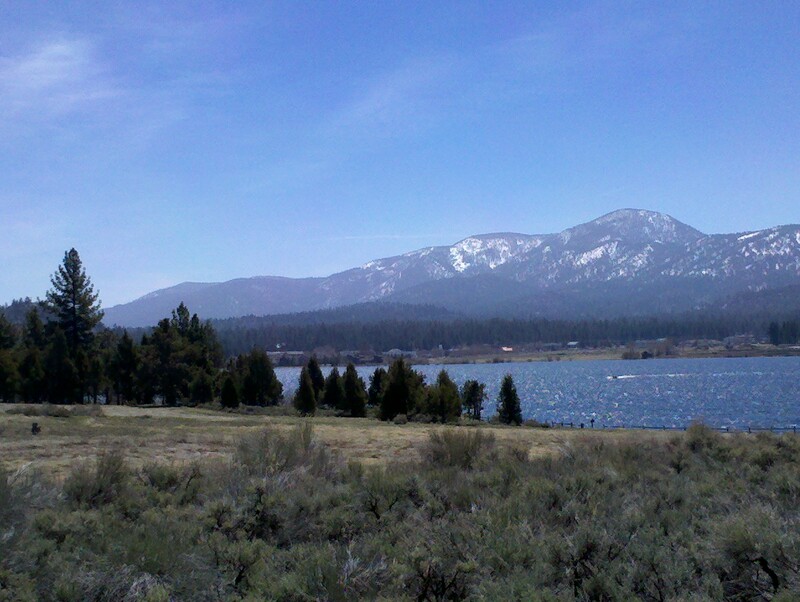 We would gain over 6,000' in elevation in less than 40 miles on State Route 18. I had been noticing the past 6 months that even on moderate climbs on cool days that my Detroit Diesel 6V92 was running hotter than it should. Normally on the flats the operating temp is around 180-182. On climbs it might get up to 195, but lately it was getting over 200, and once up to 220. I had been applying Simple Green degreaser to the radiator, but apparently I was not getting all the gunk off. Knowing that I would have to climb around 6,200' in less than 40 miles had me concerned, so this past Tuesday I applied a heated solution of Simple Green and water to both sides of the radiator several times washing it off each time with hot water. I saw a lot of particulate matter fall to the ground. I repeated the process again Wednesday and got even more off. On Thursday the temperature never got past 188! Big, big improvement. We left home around 10am, and arrived at Serrano around Noon time. 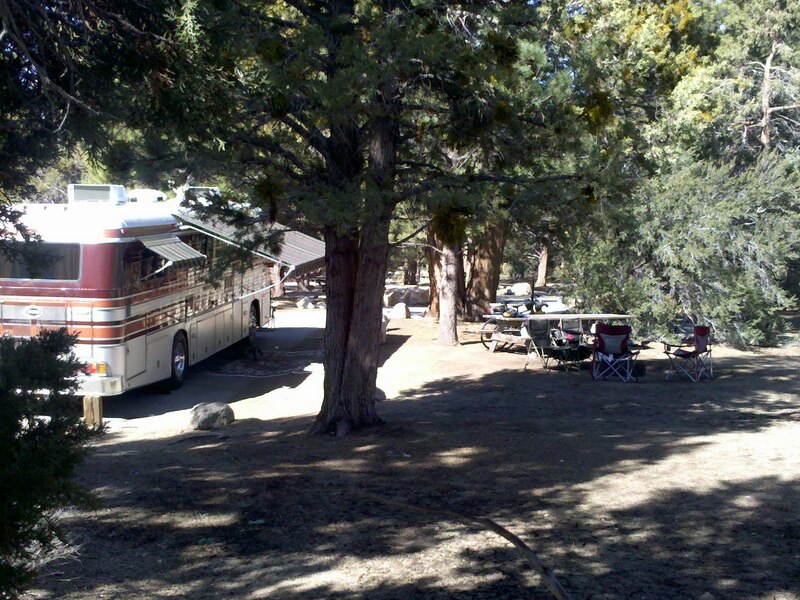 Serrano Campground is a National Forest campground, but is administered by California Land Management. There are 4, or 5 loops. Only one loop, Snowberry, has full hookups. The rest of the loops are strictly dry camping. 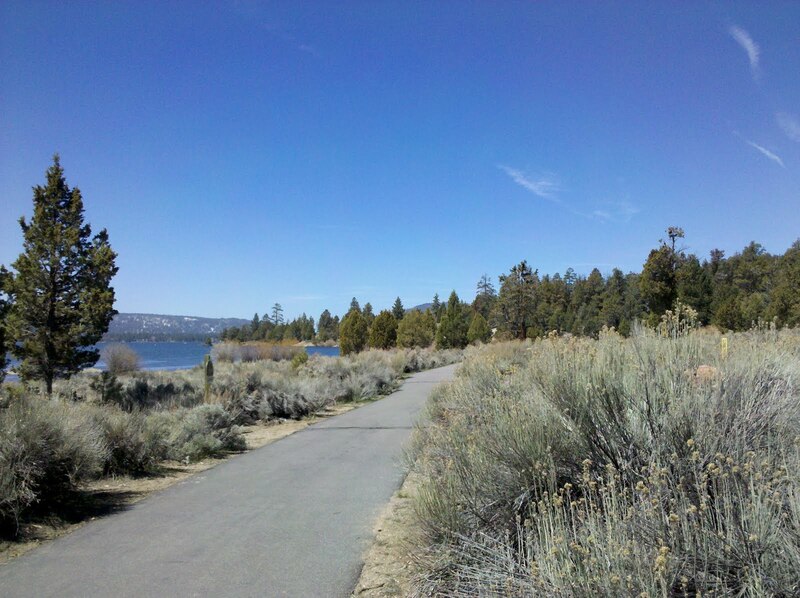 There is a bike path that runs from Serrano into Big Bear City. We rode this path a couple of times. 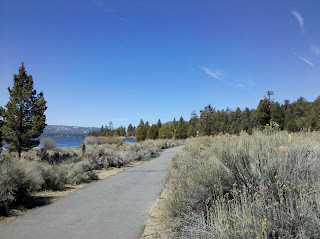 The bike path ran along the lake providing great views. We were assigned site 42, and my brother, Philip and his wife were in 41, right next to us. 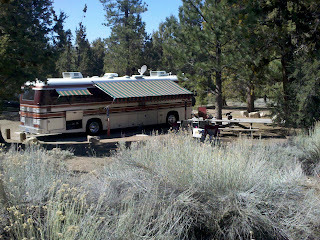 The campground was very quiet, and very well maintained. On Saturday we rode into town to find a bike shop where I could have my front hydraulic brake line bled to get out an air bubble that had developed causing the front brake to be useless. We found a shop called "Chains Required" and got the work done in about 20 minutes. 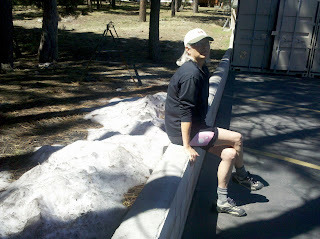 We waited outside the bike shop next to some unmelted snow from the storm last weekend that dumped about 12 inches of snow, most of which melted by this weekend due to warm weather all week. Near the boat launch ramp on the east end. April 1st marked the end of our first 2 months as camp hosts, and fulltiming in our Newell, and of being camp hosts at Rancho Jurupa Regional Park. Both Elaine and I have continued in our full time jobs (mine a little less full time than Elaine's), and our part time jobs as camp hosts. After this Wednesday we will have donated 36 hours of office time, and numerous hours spent on readying the cabins for occupancy. Needless to say March was very busy with very little down time. 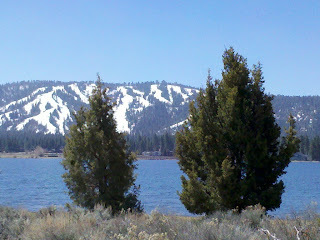 Now that we have finished our office training rotation we will be devoting our monthly hours to the cabins full time. This is a good development as we will not be locked into specific office hours each month, and can spend time on the cabins when we choose as long as they are ready for occupancy as the reservations occur. On April 14th we will take a vacation from our hosting jobs and head up to Big Bear Lake in the San Bernardino Mountains at Serrano Campgrounds (http://bigbear.us/serranocampgrounds.html) for 4 days and three nights with my brother and his family. Then, the very next weekend my oldest son and his family plus a few of their friends have made reservations at Rancho Jurupa to spend Easter weekend with us. Wednesday thru Friday of last week saw us hit with a heat wave where temps got into the mid 90's for the three day period, and then dropped 20 degrees by Saturday. Last night the lows got under 48 degrees....more the norm for this time of year. We have been exploring Riverside by bicycle, and have found it to be a very charming city. 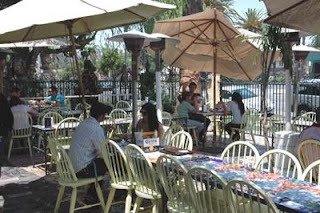 Not far from Rancho Jurupa is a funky Mexican restaurant called Tio's Tacos. Great food and a very entertaining ambiance.